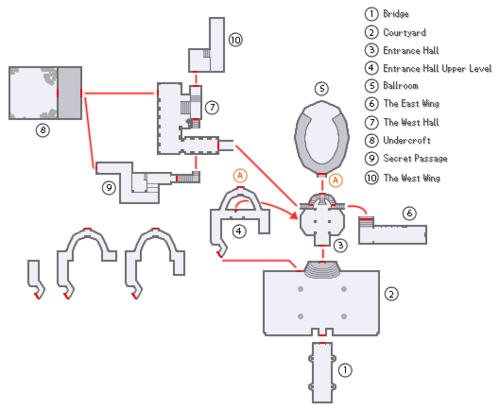 Beast's Castle is a world introduced in Kingdom Hearts II. It is based on the Disney film Beauty and the Beast. Taking place entirely within and on the grounds of a Loire Valley-styled castle in old France; Sora, Donald, and Goofy reunite with their friends Beast and Belle, who they had met at Hollow Bastion in the previous game. Like the first game, Beast will eventually join and fight alongside Sora's party in this area. In addition, several characters new to the Kingdom Hearts universe are introduced, most notably the servants of the Castle, including Cogsworth, Lumière, and Mrs. Potts. Sora and his party arrive in, appropriately enough, the castle's Entrance Hall (エントランスホール, Entoransu Hōru?). A small door to the east leads to the small Parlor (居間, Ima? 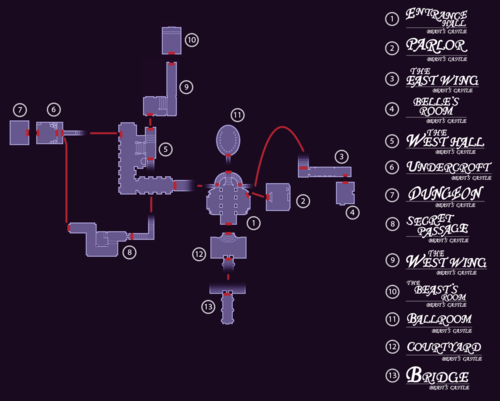 ), which holds the world's Moogle shop, as well as a save point. To the north back in the Entrance Hall is a grand staircase that leads to both wings of the castle; going straight ahead takes the party into the magnificent Ballroom (ダンスホール, Dansu Hōru?, lit. "Dance Hall"). Going to the east takes the party to the East Wing (東の棟, Higashi no Tō? ), where Belle's Room (ベルの部屋, Beru no Heya?) is located. Here, she provides information, a few chests, and a save point. Going to the west takes the party to the much larger and more involved West Hall (西のホール, Nishi no Hōru?). Suits of armor block the stairs to the right, and so the only place Sora and his group can explore, once The Wardrobe is moved, is the Undercroft (地下倉庫, Chika Sōko?, lit. "Underground Storage"). After a boss battle, the party reaches the Dungeon (地下牢, Chika Rō? ), where they meet Beast's servants and learn of the world's events. The group goes out of a secret passage in the Undercroft to the Secret Passage (抜け道, Nukemichi? ), which allows them to sneak behind the armored suits blocking the stairs back in the West Hall. Entering the door opposite the Secret Passage takes the group to the West Wing (西の棟, Nishi no Tō?) proper, at the end of which is Beast's Room (ビーストの部屋, Bīsuto no Heya?). The main doors of the Entrance Hall lead outside to the Courtyard (庭, Niwa? ), full of fighting gargoyles. During the second visit to the castle, the doors in the Courtyard unlock, allowing access to the Bridge (橋, Hashi? ), where the final confrontation with Xaldin takes place. In Kingdom Hearts 358/2 Days, a passage in the Courtyard leads to the Entrance Hall, Upper Level (エントランスホール:2階, Entoransu Hōru: Ni-kai?, lit. "Entrance Hall: Second Floor), which has a door leading to the balcony in the Ballroom and a hole in wall drops you into the main Entrance Hall. On Maleficent's orders, the Heartless attacked this world to capture Belle, who was one of the Princesses of Heart. When Belle was captured, the world fell into darkness. However, the Beast was able to escape thanks to his strong will; his desire to find Belle would eventually lead him to Hollow Bastion. The world was restored after Sora defeated Ansem, Seeker of Darkness and destroyed the End of the World. On Roxas's first visit to Beast's Castle, he is to track down a Sergeant Heartless. He hears strange roars coming from inside the castle, and he returns with Xion a couple of days later to properly investigate it. They find the castle strangely devoid of people and notice claw marks and huge footprints scattered around. They assume that they have been caused by Heartless, but they also find breadcrumbs scattered outside, which seems to indicate that someone lives in the castle and enjoys feeding birds. Roxas and Xion come across Lumière, and are dumbfounded at the idea of a walking, talking candlestick who appears to be a servant of the castle. After sneaking past, they find more footprints that appear to be leading towards the room of the castle's master, and hear another terrifying roar. When they dare to peek through the partly open door at the end of the hallway, they discover that the master of the castle has been turned into a monster different kind from the Heartless. On their way back to report to Saïx, Roxas thinks he overhears someone talking about "Lady Belle" in a side room. On their next visit to Beast's Castle, Roxas and Xion are troubled by yet another animated object, Cogsworth, is patrolling the halls. Again, they sneak past in order to carry out their duties, wondering whether all the servants in the castle have strange shapes like the two they have encountered. A few weeks later, while Xion is still struggling to recover the ability to use her Keyblade, she and Roxas are sent to Beast's Castle to destroy a Neoshadow Heartless. When they observe Lumière muttering to himself about how to reconcile the master of the castle and Belle, they wonder whether the two have been fighting over something. Xion wonders aloud what sort of person it would take to fight with such a monster. They track down and manage to defeat the Neoshadow, but are then attacked by two more Neoshadows as they were about to leave. Before either Roxas or Xion can move, the Beast appears out of nowhere, dispatching the powerful Heartless with one swipe of his claws. As Roxas and Xion marvel at his strength, the Beast roars that he will not tolerate Heartless in his castle. Roxas finds it strange that the master of the castle himself is fighting in its defense, knowing that for the Organization, it would be the underlings forced to risk their lives. Xion points out that the Beast may be willing to risk his life because he is fighting to protect what is precious to him. Xion's inability to use her Keyblade is almost revealed when Roxas and Xion are told that they will be sent on separate missions, but Axel steps in to get them one last day together, and as a last resort, Roxas lends Xion his Keyblade in the hope that it will jog her memory. Together, they fight their way through Heartless in the Beast's Castle, Roxas using a wooden stick as a weapon, and Xion regains the ability to summon her Keyblade at the end of the mission. When Roxas later returns to Beast's Castle with Xaldin, the latter is intrigued by the Beast. He explains to Roxas that the castle is cursed, and after listening in on servants' conversations, they ascertain that there is some kind of time limit attached to the curse. They overhear Belle upset about the fact that she can do nothing to help the Beast's fight against the Heartless, but the Beast himself is nowhere to be seen. In the Beast's room, Xaldin and Roxas come across a strangely powerful and clearly unnatural rose. Xaldin believes that the rose must be what the Beast is fighting to protect, and can therefore be used as a weak point. A month later, his suspicions appear to be confirmed, when on another mission he and Roxas overhear the Beast talking about how he must find a way to regain his former body before the rose wilts. On his 171st day in the Organization, Roxas arrives at Beast's Castle to hear a mighty roar coming from outside the walls, and suddenly the Beast's body is flung into the courtyard, unconscious. A giant Heartless is outside, and after a long battle, Roxas manages to defeat it. As he comes back inside to check on the Beast, he is forced to hide as Belle runs over. As Roxas listens to their conversation, he realizes that the Beast is fighting to protect his castle and the people inside it, not the rose. The Beast says it is his duty as the castle's master. Roxas realizes that Belle must be an important person to the Beast. Xaldin appears behind Roxas, and sneers at this expression of love by the Beast. Roxas asks Xaldin what love is, and he says that the power of love is no more than a worthless emotion. Roxas does not understand what he means by the power of love, but Xaldin sees no point in trying to explain to a being without a heart and simply comments that it is something he can use. Roxas wonders if the power of love is something created when a person fights to protect something precious to them. Many days later when Roxas is sent to retrieve Xaldin, who hasn't returned from the Beast's Castle, he discovers that something strange has happened. Belle and the servants are worried that the Beast has been acting strange, and when Roxas finds the Beast himself, he is furiously pacing and muttering to himself. It appears someone has told him that Belle is planning to betray him and steal everything he has. When Roxas overhears the servants talking about a suspicious man in a black coat, he realizes that Xaldin must be involved. Finally finding Xaldin by the castle gates, Roxas asks why he hadn't returned to the Organization yet. Xaldin is deliberately vague, saying only that he's been putting events in motion, and that in a little while things are sure to get interesting. Roxas suspects that Xaldin must have talked to the Beast, but can't figure out what Xaldin hopes to gain from all of it. Sora and his party enter the world and find themselves in the vast and abandoned Entrance Hall. Upon hearing a familiar growl in the distance, they identify it as that of their former ally Beast's; however, a Heartless scurries across the hall floor and leads them into the Parlor. They are surrounded by more Heartless, but Beast bursts in, laying waste to the Shadows. Instead of greeting his old friends, he pushes them aside, only interested in rescuing a rose in a bell jar on a nearby table. Confused, the party decides to go in search of answers. The party walks out of the Parlor, and Donald notices someone on the stairs, but she quickly leaves before Donald can identify who. Sora and friends decide to investigate and head for the East Wing of the castle, where Donald saw the person. Arriving in the East Wing, they hear another familiar voice lamenting from a nearby room, soon finding another old friend, Belle. Happy to see them, she tells them more about Beast's strange behavior: he has become extremely withdrawn, even going so far as to lock all of the castle servants in the West Hall dungeons. Sora, Donald, and Goofy decide to help her; they sneak into the dungeons amidst Heartless, a sleeping Wardrobe, and a dangerous guardian. There, they are greeted by the servants, who are happy to be free, but concerned about their master's strange behavior. Cogsworth guides the group through a secret passage into the West Wing, where they hope to find Beast. Meanwhile, Xaldin is with Beast in his room, feeding him lies about the castle inhabitants and especially Belle. The Beast only seeks her love, but Xaldin taunts Beast and encourages to unleash his anger on those who would try to steal or destroy his precious rose. With bad timing, Sora and his party arrive; enraged at the intrusion, the party is forced to fight Beast with help from Cogsworth. After having some sense beat into him, Beast reveals Xaldin is behind his strange behavior, turning his sadness into rage in an attempt to make him turn to the darkness. Beast goes to apologize to Belle, but before he can, he and the others hear Belle cry out for help from the Ballroom, where Xaldin has set the Shadow Stalker upon her. After a long and hard battle, it is defeated but Xaldin had disappeared. Sora explains to Beast about the Nobodies and Organization XIII, including how they probably wanted Beast's would-be Nobody on their side. Beast apologizes to Belle for his actions, but Belle scolds him for not trusting her. The servants worry about their relationship, and Lumière and Cogsworth explain the importance of the rose to the curse. Sora then uses the rose to unlock the gate to the next world. During Sora and the gang's second visit to the castle, they arrive in time for a ball that Beast is holding for Belle. Unfortunately, Xaldin and his Dragoons invades the ballroom and attacks the group. While the Dragoons keep the heroes busy, Xaldin makes off with the rose. Beast loses his temper and blames Belle for giving Xaldin the opportunity to take it; he then asks Belle to leave the castle so she won't have to bear with his temper and ugly ways. Belle is upset, but she agrees to let Sora handle things and leaves. Sora scolds Beast for his behavior towards her and giving up so easily. Beast decides to go talk with her again. On their way, they are stopped in the Entrance Hall by Xaldin, bearing the rose. He lets the group know of Organization XIII's goal to reach Kingdom Hearts, and confirms Sora's theory of why he is trying to control Beast before vanishing. Looking for him, the party goes outside. They see Belle, looking heartbroken out on her balcony. 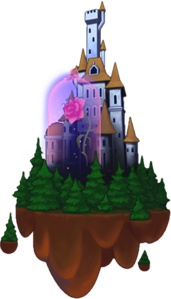 She spots the group, who warn her to return to the castle's safety, but on her way inside she sees the rose sitting nearby. Triumphant, she shows them, only to be grabbed from behind by Xaldin. He leaps away to the Bridge with her and the rose, and the group follows in hot pursuit. There, he gloats and offers Beast a choice: he can take either the rose or Belle, while Xaldin takes the other. However, the resourceful Belle elbows Xaldin in the stomach, snatches the rose away, and runs for safety; leaving Xaldin alone to fight a very angry Beast, Sora, Donald, and Goofy. Although he throws everything he has at them, Sora and company are ultimately triumphant. In his defeat, Xaldin disintegrates into nothingness. When Belle and the Beast reunite, Belle hands him the rose and reluctantly offers to leave. Beast confesses that what's important is that Belle was not hurt, and stutters his gratitude to her for saving the rose. The others then encourage a stammering Beast to tell her that he wants her to stay. She replies by offering her hand and saying she will. The two then dance around the Courtyard, having their ball at last. Some time after the defeat of Xemnas, the spell breaks and the Beast turns back into the Prince. Belle and the Prince hold a ball to celebrate. In the manga adaptation, several others enchanted servants appear, such as a footstool-dog, though they have no spoken lines. This page was last edited on 20 March 2019, at 13:44.